I am having a leading problem with my K38. I just got it a few months ago and don't know what normal is. I bought it to use for the CF portion of conventional pistol. After buying it I sent it to have the timing adjusted, cylinder stop tightened and a scope mount installed. The lock-up seems tight. I just started using Roze distribution lead WCHB loads. After putting 150 rounds down range with it I noticed some really bad leading around the forcing cone, on the top strap, and on the outside of the cylinder. I assume the lead on the outside of the cylinder is coming from lead being ejected from the gap, hitting the top strap and then being deposited on the cylinder edge. Her are some photos. My question is this....Is this amount of leading normal? If not what do I need to do to stop it from happening? I have shot lead bullets from my 1911 before and had very minor leading issues. Just a little in the barrel near the chamber which is easily cleaned up with any of the lead removing chemicals. The leading on the K38 is really bad in my opinion. If it's the Zero's, look here. clean the bullets in gasoline (per Jerry) then use this stuff..
otherwise, use Remington HBWC's. very little to no leading. Also, are your bullets matched to your cylinder throats? It looks like maybe your load is very hot.. I am using a .357 diameter bullet. It is the standard wchb load for Roze distribution. I don't know what powder and am mount they use. There seems to be a lot of smoke from the gun...maybe bullseye? The rounds don't seem to be very hot compared to factory jhp loads. In my opinion you have an alignment problem. It looks like part of the bullet is being sheared off by contact with the edge of the forcing cone. It could be timing, bent crane or wear (looseness). I see that you are buying loaded ammo so that seems to rule out some of the other usual suspects. Like I said that is just my opinion. OldMaster66 wrote: In my opinion you have an alignment problem. It looks like part of the bullet is being sheared off by contact with the edge of the forcing cone. It could be timing, bent crane or wear (looseness). I see that you are buying loaded ammo so that seems to rule out some of the other usual suspects. Like I said that is just my opinion. So I measured the diameter of the cylinder throats on the K38. They average ~.357 inches. I am using a .357 diameter WCHB bullet from Roze. Should I be using a larger diameter bullet like .358 or .360? I noticed when using the Roze WCHB rounds that a lot of gas is coming from the gap. I might be imagining things though. Much more so that when I used JHP rounds from commercial sources. Any advice on how to best match my WCHB bullets to this gun? I had a model 19 that did that. Worked fine with jacketed bullets. The lead was so bad it got into the cylinder center. The cylinder pivot had those little grooves that go sideways. Also my range rod hung up in the barrel at the pin. Not much evidence of even a decent forcing cone in that picture.. A Taylor Throat corrects a maltitude of ills.. I wonder how come S&W never caught on to better forcing cones. And again, who will do a Taylor today? Did/do Colt OMM have decent cones? I hate S&W forcing cones. 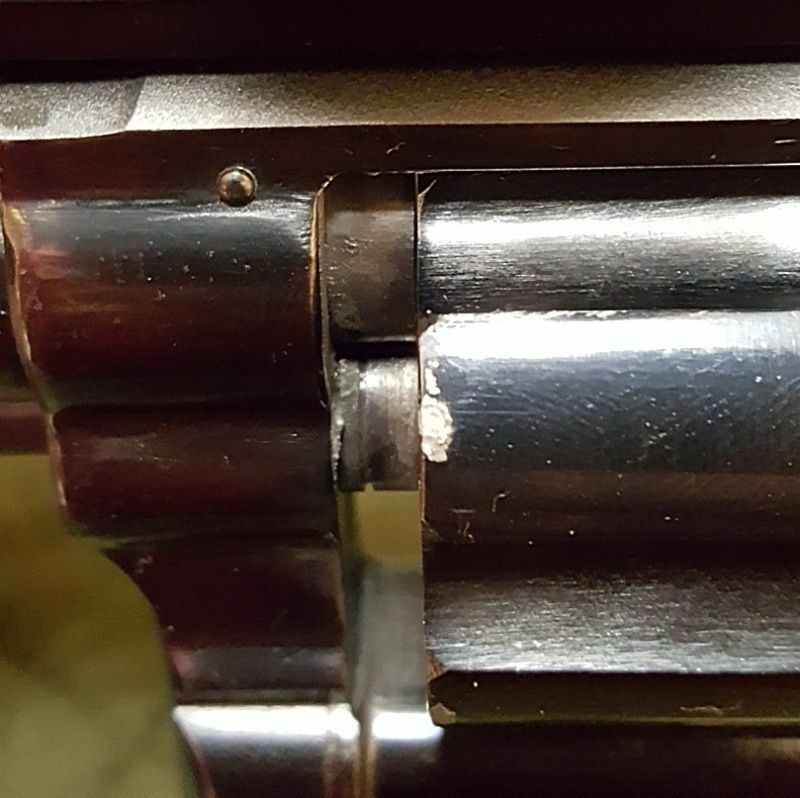 As nice as the workmanship is on most of the pistol (for a factory effort), the forcing cones are horrible, and appear to always have been based on all of the pieces I have seen and worked on. As Jerry mentions, they are not ideal, but they are made worse by all of the tool marks left in them that just add to the leading and fouling problem that they are supposed to prevent (along with alignment during this critical transition). Have the alignment rechecked, and have the forcing cone worked on by someone who knows. Scrub your cylinder throats squeky clean with no signs of lead deposits. You need to slide something of known diameter thru the cylinder throats to determine the diameters. If you have a bullet, measure it with micrometers, not calipers, and see if it slides thru the throat. It should be at least a firm press fit. + What others have said. Joe, You may have noticed a certain lack of response to your last question. I am going to go out on a limb here and respond. You have not got any response (in my opinion) because no one thinks that the problem is the bullet. If Roze was producing a bullet that did that to all revolvers then we would have heard about it and discussed the heck out of it. I am afraid the problem is with the pistol not the ammo and that is why no one has any advice on how to match that ammo to your revolver. About the first question. I think a larger bullet would make the problem worse. Just my .02. Joe, I have a 14-2 that had a badly cut forcing cone. 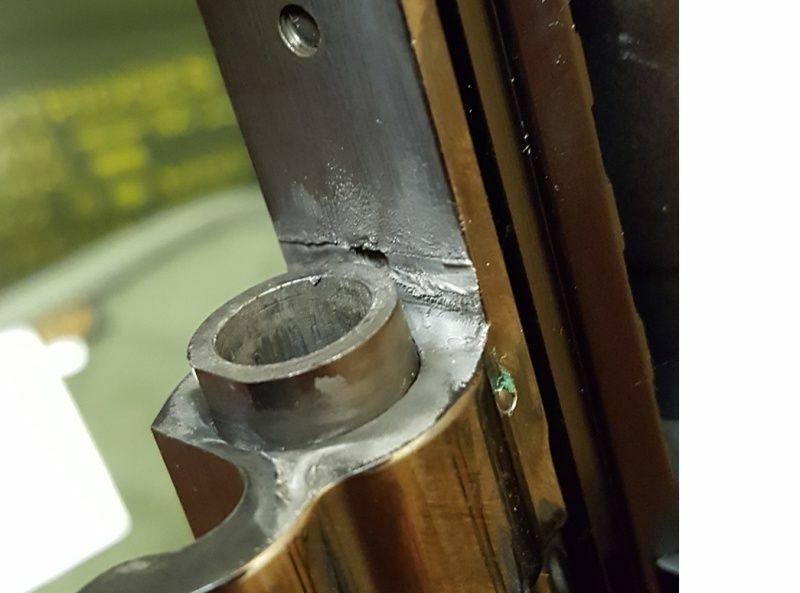 Out of parallel with the barrel by .020. with feeler gauges check the barrel to cylinder gap on both sides of the barrel and see what that is. I think it should be .005 or less. Push slightly oversize bullets through each throat and measure with a real micrometer, not a dial caliper. The barrel will be harder to measure because it has 5 lands and grooves. You can slug it by pushing a bullet through but measuring the slug is a challenge. If the barrel slug falls through the chamber throats you know its smaller than the throats. If it hangs, the barrel is larger than the throats. This gives you some important information to start with. Then, what to do? You'll need a good gunsmith who works on revolvers and has proper tooling. I'd probably go for uniforming the throats and cutting a nice forcing cone in the barrel. The dimensions of your particular gun will determine what work it needs. What you don't want is for the chamber throats to squeeze down your bullets before they get to the barrel. Undersize bullets entering the barrel are bad.